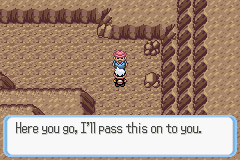 With the second gym badge under your belt, you can now deliver the letter to Steven. 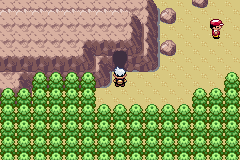 Head Northwest of Dewford Town and enter Granite Cave. 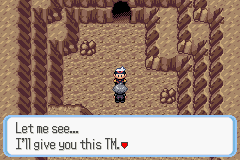 Talk to the man once you enter the cave and he'll give you HM05 - Flash. 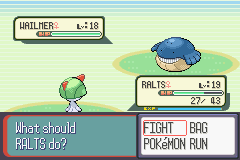 While it's not necessary, teaching a Pokémon flash now is a good idea. 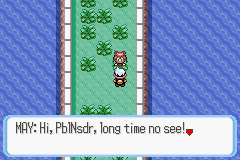 Once you find a compatible Pokémon (Nincada can be taught Cut and Flash, so it's a great HM Slave early on), head west down the ladder, making sure to pick up the Escape Rope on the way. 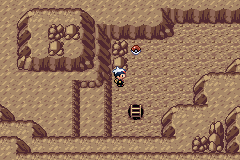 After using flash to light up your path, the only thing to do on B1 is grab the Pokéball from an Item Ball south of the mudslide. Head down the next ladder! Follow the path until you get to a ledge with a single stone on it. 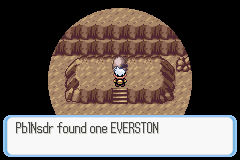 Examine it with A to find an Everstone. Continue east and take the next ladder up. Take one more ladder up after this and you'll be on F1 again. 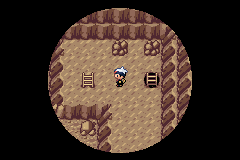 Head west then south here and take the cave exit to find the room where Steven is. He'll give you TM47 - Steel Wing in exchange for the letter. 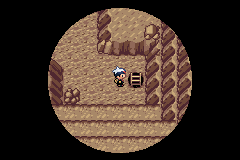 Head north to the former room and use the rocky ledges to take a shortcut out of the cave. That's all we had to do in Dewford Town. 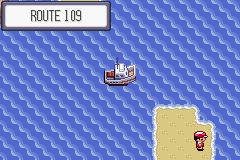 Head back to the dock, talk to Mr. Briney, and set sail for Slateport! 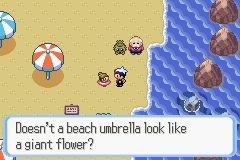 You'll arrive on a beach just south of Slateport. 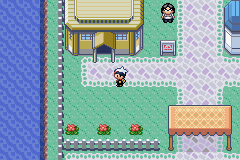 There's a total of four trainers you can battle here, all of which can be avoided if desired. 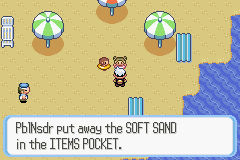 You can talk to the girl in the pink tube to get some Soft Sand. 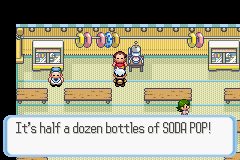 There's a building in the northwest corner of the beach, enter it and defeat all three trainers here to get six bottles of Soda Pop from the man up front. 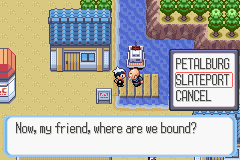 Once you're done battling here, head into Slateport. Slateport is home to three main attractions. 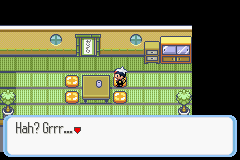 There's a market that gives you the chance to buy many items not sold in a typical Pokémart, there's a contest house (red building near Pokémon Center) that allows you to enter your Pokémon in various contests, and there's the name rater. 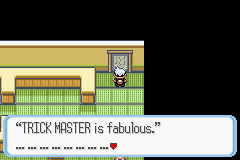 He'll change the nickname of any Pokémon as per your request. Start your errand running adventure by entering the contest house. 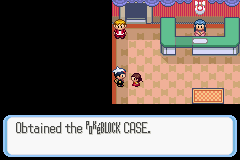 Talk to the little girl here and she'll give you her extra Pokéblock Case. 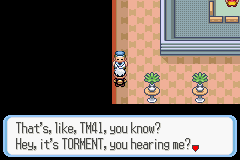 Enter the next room and talk to the sailor in the southwest corner to get TM41 - Torment. 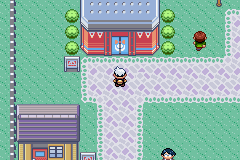 Next, head to the brown building on the west side of town (just above the market). 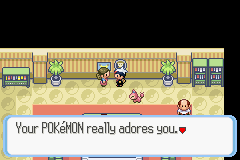 This is the Pokémon fan club, a place where you can buy accessories for your Pokémon to improve their results in contests. 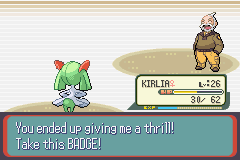 If your Pokémon likes you enough (your starter Pokémon should at this point, assuming you haven't let it faint often) and is at the front of your party then the lady in the back will give you a Soothe Bell. 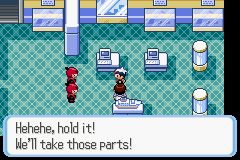 Finally, head to the Pokémart and purchase one Harbor Mail, you'll need it later. Now that your freeloading is done, you can advance in the story. 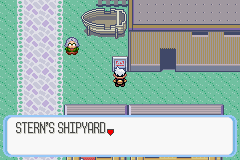 Head over to Stern's Shipyard (the brown warehouse building surrounded by boats) and speak to the first man you encounter. He'll ask for you to seek out Captain Stern. You can now enter the museum directly north of here, do so with haste. You'll have to pay the (!!!insertpokedollarimagehere!!! )50 entrance fee to get in. 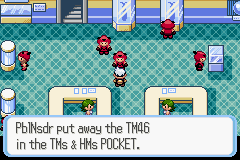 Speak with the only Team Magma/Aqua member who's moving arround and he'll fork over TM46 - Thief. Head upstairs and talk to the man, who just so happens to be Captain Stern. 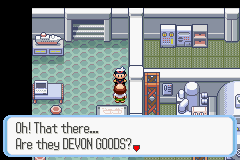 Just as you're handing over the Devon Goods, Team Magma/Aqua steps in and you'll need to defeat two grunts in battle. Captain Stern will thank you for your help before leaving abruptly. 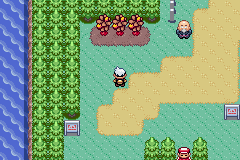 Team Magma/Aqua grunts will no longer be blocking Route 110 to the north, indicating you should probably head that way. Head north and defeat the trainer here. You'll come to a building with a purple roof, this is the trick house. You can solve a puzzle here for a reward. Enter the building and press A by the top right corner of the table to find the Trick Master hidden under it. He'll invite you to partake in his challenge. 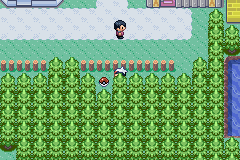 Use cut on the tree to your right and defeat the trainer who challenges you here. Keep using cut until you get to the Item Ball containing an Orange Mail. Head back to the start, this time making your way forward. 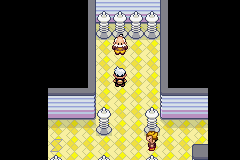 Take the next right and defeat the youngster here. 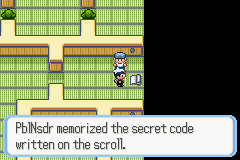 You'll then be able to examine the scroll and memorize it's contents. 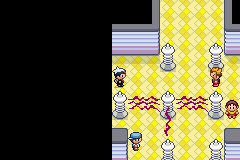 Following the only remaining path, defeat the final trainer, and press A in front of the scroll to enter the code. Enter teh door to find the Trick Master who will reward you with a Rare Candy. 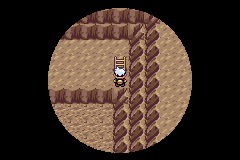 You can return to the trick house throughout the game to solve more puzzles for rewards. 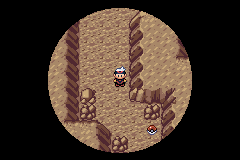 Take the path to your west to gain some exprience by battling four trainers. Cut down the trees on the upper path to find a Guard Spec in an Item Ball, 4 Cheri Berries, and 2 Leppa Berries. Now head right from the trick house and you'll soon find an Item Ball containing a Dire Hit. Battle the youngster here and head north. 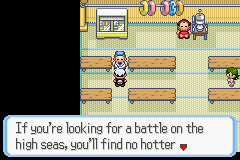 Head north to battle your rival, May/Brendan (I recommend saving first). 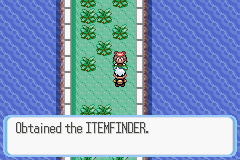 If you win, you'll receive the Itemfinder. 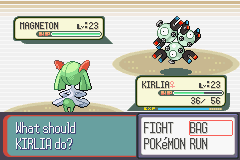 You may have to train for a while if you plan on winning, this is probably the most difficult battle so far. 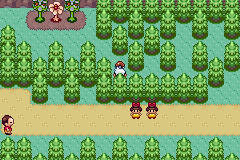 Press forward on this path and defeat the two remaining trainers. 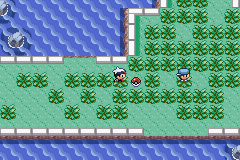 You'll be able to pick up 9 Nanab Berries at the end of the route before entering Mauville City. Head right as soon as you enter the city to pick up an X Speed in an Item Ball. Enter the house directly north of it to get HM05 - Rock Smash from the man inside. 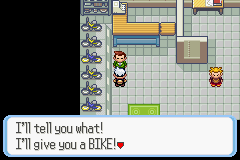 Head to the bike shop next where Rydel will give you a free bike. 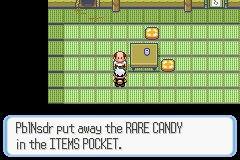 This is a pretty generous of him, since they cost upwards of (!!!POKEDOLLAR!!! )1,000,000 in previous games! You'll have a choice between the faster Mach Bike or the more technical Acro Bike. Take your pick, you'll be able to switch whenever you need a certain one. 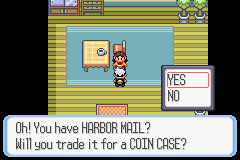 Enter the building next to the Pokémart and trade your Harbor Mail for a Coin Case. 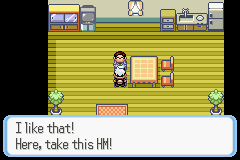 You can use this to play games in the Mauville Casino. You can now head to the gym. 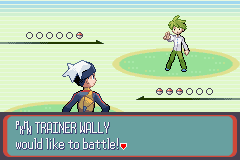 Wally is waiting in front of the door, you'll have to battle him and his level 16 Ralts before you can enter. 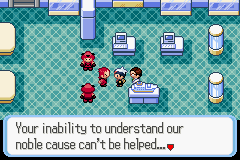 Go ahead and heal up, do any necessary training, buy some paralyz heals, and hit the gym (see what I did there? )!